The #twesume and how to condense your Resume or CV into 140 characters or less has been doing the rounds for quite a while but seems to be gathering a head of steam again. For those of you that have not climbed aboard the twitter band waggon, the twesume is a way of using twitter to promote your cv by describing yourself in an interesting way abbreviated to 140 characters. The bottom line according to Dawn is that the Vine Resume did not get her the job it came down to good old fashioned networking and a referral from a friend. However, the employer was impressed with the video which was introduced by Dawn when the opportunity arose. 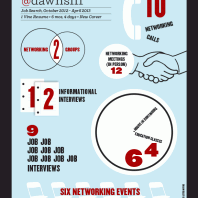 Dawn produced an infographic to explain how she approached her job search and the effort that she put in. Personally, I think the most telling aspect is the date stamp at the top and how long it took her to secure a position: 6 months and 4 days.